All of these recipes can be made ahead, or at least prepped in advance, to ensure a more relaxing weekend at the lake or beach. Do your prepping in the comfort of your own home, and place in bags ready to go. 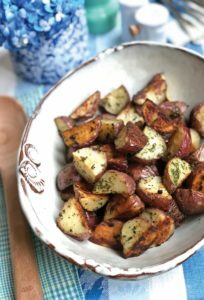 When you arrive at your destination, simply quarter the potatoes, toss, and bake. This simple, crowd-pleasing dish tastes delicious with steak and also pairs well with shrimp and chicken. Preheat oven to 400 degrees. Wash red potatoes, pat dry, and put in 1-gallon ziplock bag. Refrigerate potatoes until ready to bake. In snack-size ziplock bag, combine minced garlic and next 3 ingredients. Remove potatoes from bag, cut into quarters, and return to the bag. Add seasonings and ¼ cup olive oil to bag. Seal and shake until thoroughly coated. Preheat baking sheet for 5 minutes. Remove from the oven, and pour potato mixture out of bag onto the hot baking sheet. Bake 40 to 45 minutes or until golden brown, stopping halfway through to flip potatoes. Serve immediately. Serves 8. It’s one less step when the marinade and sauce are the same. You can easily transport the flank steak in a ziplock bag. If there is any leftover chimichurri sauce, pour it over grilled chicken or pasta for another meal. Roughly chop the garlic, shallots, and jalapeño, and place into the bowl of a food processor. Add vinegar and salt; pulse 3 to 4 times (max) until evenly chopped. With a knife, roughly chop next 3 ingredients, and add to food processor. Add oil, and pulse 2 times; stop and stir mixture to ensure even chopping. Pulse 2 to 3 more times until coarsely and evenly chopped. In a large ziplock bag, evenly coat flank steak with 1 cup of the chimichurri sauce. Refrigerate at least 8 hours or overnight. 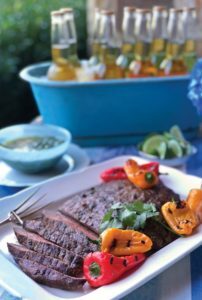 Remove flank steak from marinade, and pat dry. Grill at medium-high for 8 to 10 minutes on each side or until desired doneness. Allow to rest 5 minutes before slicing. Serve with remaining 2 cups chimichurri sauce. Serves 6. Learn from Leslie: Grill the mini sweet peppers for 10 minutes while grilling the steak. For this recipe, I like to poach the chicken in water with a dash of salt and a drizzle of olive oil instead of baking it. This method helps it stay moist and white. This recipe makes an easy supper or a quick lunch. I often use the dressing on a green salad too. It’s that good! Mix all salad ingredients, except avocados and pecans, in a large bowl. Set aside. Combine all dressing ingredients in a jar, and shake until combined. Toss salad mixture with dressing. 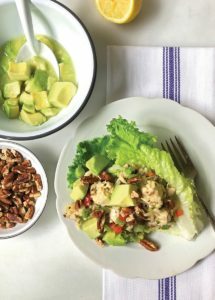 Serve on a bed of leaf lettuce, and garnish with chopped avocado and toasted pecans. (The salad will keep several days once tossed.) Serves 5 – 6. The lemon juice brightens up the canned artichokes to give them a fresher taste. 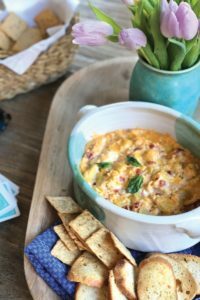 This dip can be made up to 48 hours in advance and stored in an airtight container. For a smaller crowd, bake half at a time, keeping the remainder in the refrigerator until needed. In a medium-size bowl combine first 7 ingredients. Refrigerate until ready to bake. (This can be done up to 48 hours in advance.) Place in a lightly greased 1½-quart baking dish. Bake at 375 degrees for 15 to 20 minutes until hot and bubbly. Garnish, if desired. Serve with crackers. Makes 4 cups. I always have these ingredients on hand to whip this up the night or two before a trip. It’s a nice alternative to soft drinks. In the summer, I like to drink this with breakfast! Place tea bags in a 2-quart measuring cup or heat-proof bowl. Pour boiling water over tea bags, and allow to steep for 30 minutes. Remove tea bags, and pour tea into a 1-gallon container. Add sugar, and stir until dissolved. Add lemonade concentrate and water to fill container. Stir to combine. 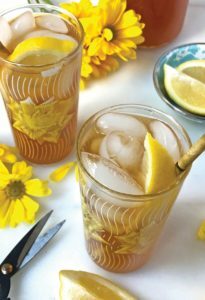 Chill and serve over ice with lemon wedges, if desired. Makes 1 gallon.